We want you to experience the perfect combination between functionality and style. Our shower tub combo units are made with care right here in the U.S.A. They come with several safety features and make it easy to utilize it how you want, when you want. Walk in bathtubs aren’t always a great fit for everybody, that’s why Aging Safely is committed to offering a variety of the top brands and styles. All at a price that’s affordable. We offer free shipping on all shower tub combo’s, walk in tubs and handicap showers. Our goal is to help you find the best product for your unique needs. Something that will benefit your lives and add to your enjoyment without breaking the bank. Our value added services can help make choosing a bath shower combo an enjoyable experience. There are several options available including warm air hydrotherapy. Experience the spa in your own home. Now you can have the best of both worlds. Shower when you want, but always know you can take a hydrotherapy soak anytime you want. Our combo packages are modern and can go with almost any decor. 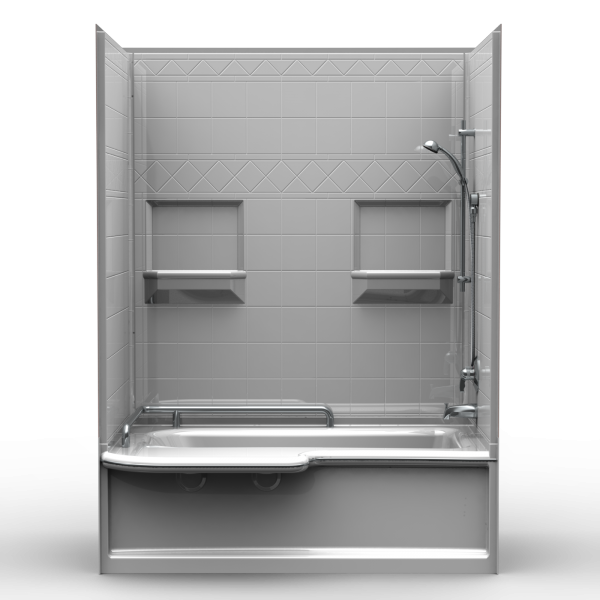 Click here if you would prefer to learn about our handicap shower units. This is a four piece bathtub/shower combo that has an 18” threshold height. It comes available in a left or right hand drain configuration. It comes standard with two built in soap dishes and diamond tile wall pattern finish. You can customize it with numerous accessory options. You can select hydrotherapy jetting, safety grab bars and even a thermal mixing valve to help regulate appliance temperature. Our tub shower combo is the perfect balance between functional and stylish. Not only does it offer safety features and ease of use, but it looks sharp and will be sure to brighten up your bathroom. Learn about walk in tub shower combination here.